The Presentation tradition of prayer is central at Mount Loretto. We gather daily for prayer in our Sacred Heart Chapel. We pray the Liturgy of the Hours, an official prayer of the Church whereby the hours of the day are consecrated to God. We spend time each day sharing in prayer and taking part in Mass as a faith community. We invite you to join us for daily Mass at our Sacred Heart Chapel. From time to time there could be changes in the Mass schedule. 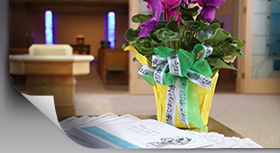 If you do not attend Mass at Mount Loretto on a regular basis, we encourage you to call the switchboard at 563-588-2008 ahead of time to verify the times. On the 21st of every month, we pray for vocations. On the 25th of every month, we pray for our friends and benefactors at our daily Eucharist. We invite you to share your prayer requests.